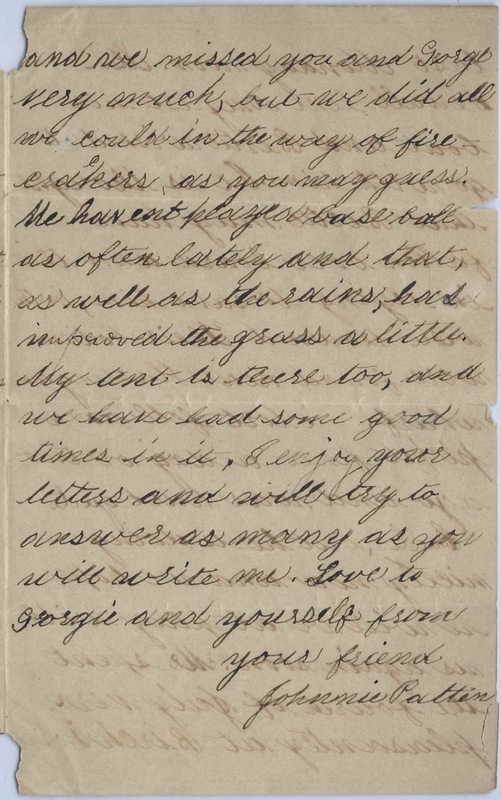 July 12, 1873 letter from John Owen Patten, "Johnnie", at Bath, Maine, to his friend Amory McLellan Houghton, who was on a voyage and had sent John letters from Liverpool and London, England. The Pattens and Houghtons were seafaring and shipbuilding families at Bath, Maine. Johnnie's mother Emma Maria (Owen) Patten included a note that the Houghton house was safe. 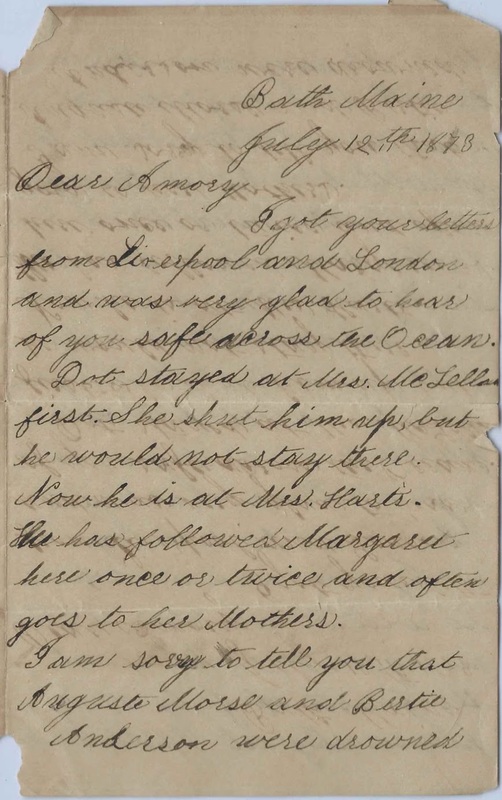 See another letter written to Amory on the same day by George H. Patten, perhaps a cousin of John Owen Patten. 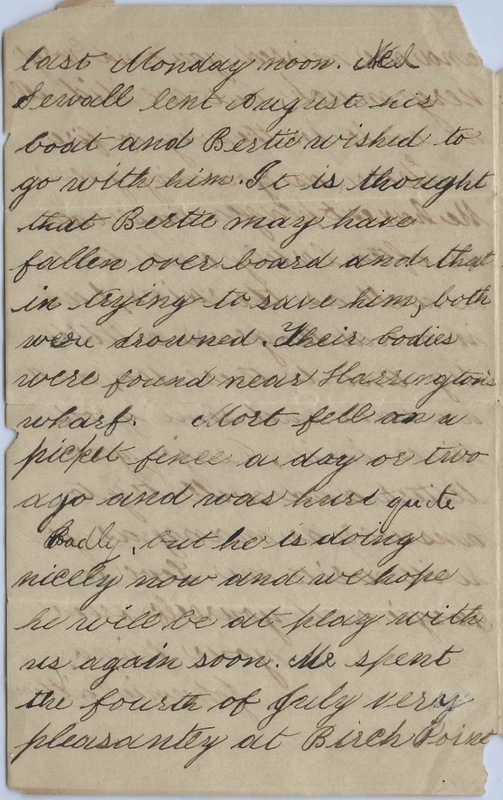 Mort - who fell on a picket fence and "was hurt quite badly but is now doing nicely"
John, "Johnnie", mentions a sad event, the recent drowning of August Morse and Bertie Anderson, who had borrowed a boat from Ned Sewall [presumably Edward Sewall, the father or more likely his son]. Their bodies were found at Harrington's wharf. Johnnie noted that speculation was that Bertie had fallen overboard and that August drowned trying to save Bertie. According to his 1892 passport application, John Owen Patten was born at Bath, Maine, on April 20, 1861, the son of sea captain and shipbuilder Gilbert Elbridge Russell Patten and Emma Maria (Owen) Patten. On February 23, 1886, John married Lucy Weston Larrabee, daughter of Charles Weston Larrabee and Eliza Sophia (Smith) Larrabee. It appears that that marriage ended, as John married Irene Mary Everett at Melrose, Massachusetts, on August 26, 1897. John became a journalist and editor at Boston, Massachusetts, and later at Bath, Maine, where he owned the Daily Times. He died on April 29, 1899 at Phoenix, Arizona. I didn't find children from either marriage. I got your letters from Liverpool and London and was very glad to hear of you safe across the Ocean. Dot [possibly a dog ?] stayed at Mrs. McLellan's first. She shut him up, but he would not stay there. Now he is at Mrs. Hart's. she has followed Margaret here once or twice and often goes to her Mother's. My dear Amory. Johnnie has forgotten to say that Margaret sends you much love and wishes you to know that your house is all safe. E. M. Patten.